Community palyground and picnic area with basketball court. Lovely home with oversize 2 car garage. On .49 acres with Kentucky Blue Grass lawn. landscaped, retaining wall ggardens and raised bed planter boxes. Two apple producing trees in back yard with rasperry and trained ssweet goose berry plants. 2 sheds, one for garden, and one10 by 14 foot for "stuff". Handicap ramp and handicapped accessible bathroom. Jetted American Standard tub in master bedroom. Hard wood floors in Kitchen, hallway, with engineered wood floors in dining room. Generous housing allowing if you buy, New 3 dr Samsung referigator and Whirpool front loader washer and gas front loader available for purchase options. 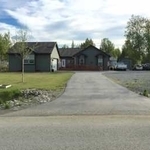 Close to downtown Palmer and 15 minutes to shopping in Wasilla. Numbers schools for all grade levels nearby. About a 35 minute drive to JBER or Anchorage. Nunerous state and Federal parks and recreation areas. Great fishing in nearby streams, rivers and lakes.